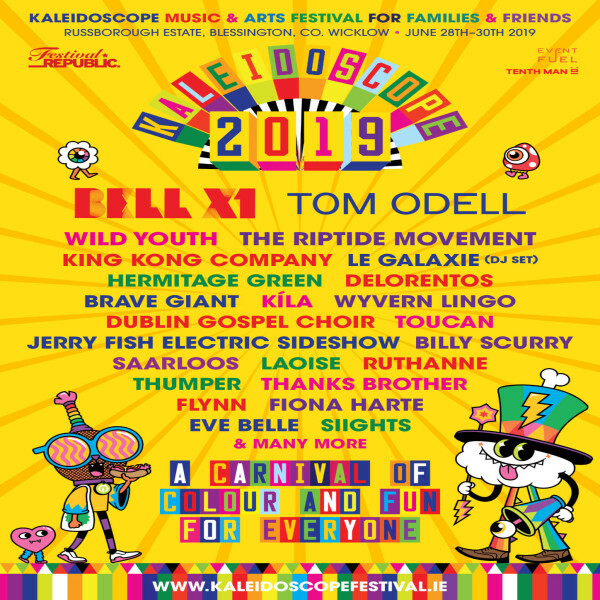 Kaleidoscope, Ireland’s first family camping music and arts festival, has announced their headliners and first wave of arts that will be playing at the debut of the festival. The festival is of to an impressive start, with their impressive debut line-up, which features stellar headliners Tom Odell and Bell X1. 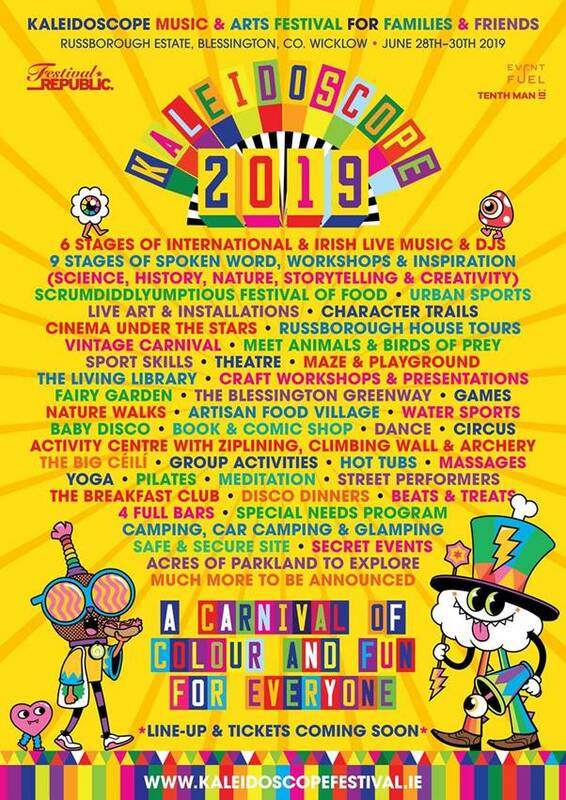 The brand new festival, Ireland’s first family camping festival, will make its debut at the Russborough Estate, in Blessington, Co. Wicklow, Ireland, between the 28th and 30th of June 2019. Tickets for the festival will go on sale, on Tuesday the 16th of April 2019, at 9am, and can be purchased from Ticketmaster. Among the first wave of artists to be announced and joining the two impressive headliners, Tom Odell and Bell X1, is Wild Youth, the Riptide Movement, King Kong Company, LE Galaxie (DJ Set), Hermitage Green, and Delorentos. The following names are also among the first to be announced and joining the already stellar line-up is Brave Giant, Kila, Wyvern Lingo, Dublin Gospel Choir, Toucan, Jerry Fish Electric Sideshow, Billy Scurry, Saarloos, Laoise, Ruthanne, Thumper, Thanks Brother, Flynn, Fiona Harte, Eve Belle, and Siights, with many more still to be announced. Kaleidoscope Festival is set to provide three days of high energy entertainment, that is full of colour, over 16 stages.Along with the line-up announcement, organisers also released the festival’s programme, which includes six stages of International, Irish live music and DJs; nine stages of spoken word, workshops and inspiration (Science, History, Nature, Storytelling and Creativity); Scrumdiddlyumptious Festival of Food; Urban Sports; Live Art and Installations; Character Trails; Cinema Under the Stars; Russborough House Tours; Vintage Carnival; Meet Animals and Birds of Prey; and Sport Skills. Festival goers can also expect Theatre; Maze and Playground; The Living Library; Craft Workshops and Presentations; Fairy Garden; The Blessington Greenway; Games, Nature Walks; Artisan Food Village; Water Sports; Baby Disco; Book and Comic Shop; Dance; Circus; Activity Centre with Ziplining, Climbing Wall and Archery; The Big Ceili; Group Activities; Hot Tubs, Massages, Yoga, Pilates, and Meditation; Street Performers; The Breakfast Club; Disco Dinners; Beats and Treats; four Full Bars; Special Needs Programme; Camping, Car Camping and Glamping; and Secret Events, with much more still to be announced. Introducing the brand new festival, in a statement, organisers, said: “There has been much speculation about our brand new festival. We are delighted to introduce to you KALEIDOSCOPE – a tantalising new three day camping festival for family and friends. The stunning Russborough House, Blessington will play host to its first EVER festival from Friday 28th to Sunday 30th June 2019.